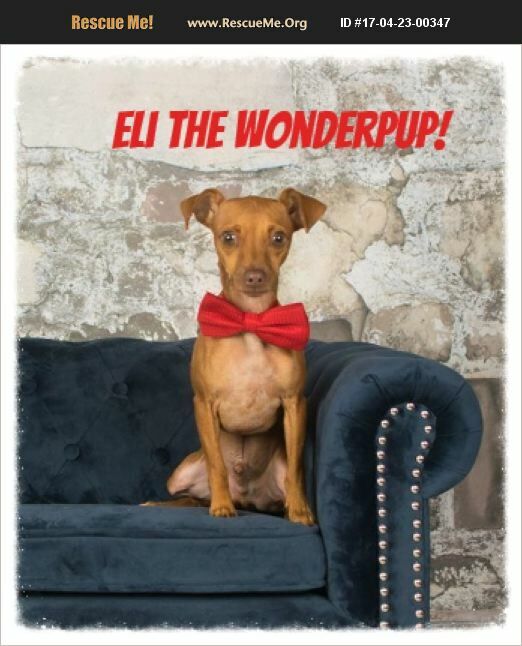 Eli's mom was a miniature pinscher that came into animal control pregnant. She has since been adopted and Eli is waiting for a home. The pups were born 3/14/2016. All the pups have had extensive veterinary care. They are fully vaccinated, spay/neutered, microchipped, puppy teeth extracted, heartworm negative and on monthly preventative etc. Eli is a little man at about 8#. He is super sweet and cuddly and would love another small doggie playmate. If you are interested in adopting, please fill out an online application at: http://houstonbostonrescue.org/adopt/application/ You do not have to pay the processing fee to BTR (ignore the auto-reply email). However, be sure to specify that you are interested in a MinPin on the application so that the application is fwded to me. There is a $25 processing fee payable to reh_pinscher@yahoo.com via paypal and only completed applications will be processed after receipt of payment. After the application is processed, a home visit and meet and greet with the dogs will be scheduled. Typically the next day after the home visit, the adoption is finalized.